I was about to turn 40 when I joined Rotary. The timing was perfect. I’d wandered into a profession, computer software development, where I was disconnected from any community. I was developing a somewhat complex database program for betting on horse races, based on 70 variables for each horse that enabled me and my colleagues to determine its true odds of winning in any race, once we entered all the data and did our modeling. But we had to key the information into our Kaypro computers – this was way back when, and there were no available online racing databases in the mid-’80s. My interaction was entirely with a computer screen. We didn’t have customers or clients, so I had little opportunity to connect with other humans. And I was living in Hong Kong, a long way from Pittsburgh, my home. There were far fewer horses racing in Hong Kong than anywhere else, I discovered, so my business partners and I had packed up our primitive computer equipment and moved there. Our goal was to handicap every Hong Kong racehorse based on past performance, track conditions, and so forth, and place strategic bets based on the results. It was a huge amount of work – but profitable and perfectly legal. By 1996, the business was becoming a substantial success. I was now betting my own money and doing quite well, but unless you’re an extremely gregarious person, which I’m not, you don’t make that many new friends in foreign surroundings. That was the draw of Rotary for me. 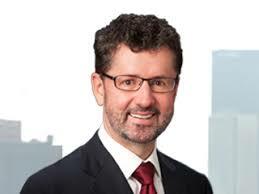 Our business lawyer, Gilbert Collins, invited me twice to join the Rotary Club of Kowloon North before I accepted. I must have had some trepidation; I’m not a joiner by nature. But before I knew it, I was on my way to becoming a member. Rotarians respect the dignity and usefulness of all professions. There was no service component to mine, so I felt immensely honored to have been asked. In the first year after I became a member, I learned more about the Hong Kong community than in all the time I’d been living there. Looking back, it’s not surprising that I would become deeply involved in the club’s service projects. I soon became the club’s international service director and was charged with reaching out to join forces with clubs in other countries. 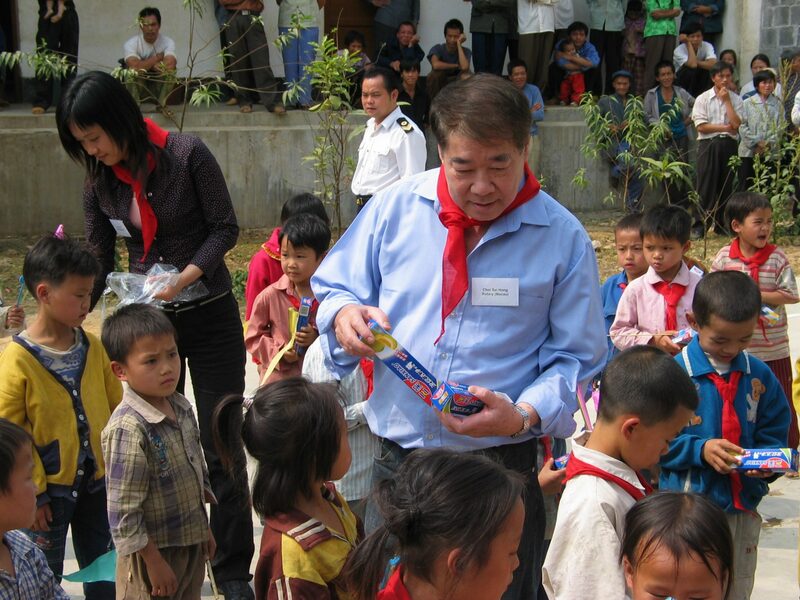 Bruce Stinson, past president of the Kowloon North club, had already made friends with Sai-Hong Choi, past president of the Rotary Club of Macau, and had visited impoverished Du’an County in southeast China in 1999. He’d been moved to tears by the condition of many of the area’s rural schools – the roofs and walls had collapsed, and there were no desks or seats, he reported. The Macau club lacked funding, and that’s where we stepped in. 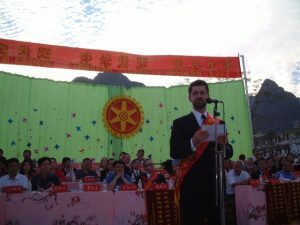 I knew that it would be something of a gamble to make our way through the Chinese regional bureaucracy and ensure that the money we raised went where it was intended, but I’d been gambling successfully for most of my adult life. In my junior year, I had dropped out of Case Western Reserve University, where I was studying physics and philosophy, and gone to Las Vegas with my friends to play blackjack. I remembered a sign I’d seen as a teenager in an Atlantic City casino: “Professional card counters are prohibited from playing at our tables.” That always stayed with me; it meant that if you learned to count, you could win. And that’s what we did until we got bounced out of all the Las Vegas casinos. Card-counting improves your odds and is completely legal, but Nevada casinos are private property, and owners can bar anyone they want from entering. In our early 20s, we were averaging about $80,000 each per year at blackjack, which was pretty good back then for young kids. I never made a serious career choice to become a gambler. My only real interest has been to beat the system and come out ahead. I have a fondness and an aptitude for numbers, which helps – and, as I discovered through Rotary, a passion for putting my skills to work for causes I believe in. As I got to know the Chinese government officials in Du’an, my level of trust increased. They turned out to be sincere and honest and grateful for our help. The government agreed to put up half the money if we put up the other half – a total cost of about $60,000 to rebuild each school. To me, this seemed like a slam-dunk, and thanks to the success of my business, I was able to donate a substantial amount of those costs on my own. The Kowloon North club teamed up with the Macau club to build the first three schools in the region, and since then, our district’s clubs have been able to fund many more. Putting the money into bricks and mortar assured us we were creating something of lasting value, that the money wasn’t being frittered away. It was my kind of gamble. For me, one of the most rewarding results of these service projects is to watch my perceptions bump up against reality. I expected China to be a tyrannical place, even brutal. But my Rotarian colleagues and I learned a few things as we watched the Long’an middle school in Du’an being transformed from a dilapidated building into a functional structure. I asked the headmaster about discipline. “Do you spank students?” I wondered. He looked at me incredulously. “Spank students?” He was shocked at the suggestion. Teachers and administrators are forbidden to employ physical punishment, he explained. “They do that in your country?” It was inconceivable to him that we could even think that was possible. So much for my concern about social protectors. Now, about 11 years after the first schools were rebuilt, Du’an has become a thriving region. When we visited in 2008, schoolchildren no longer looked at our cameras in awe; they snapped digital photos of us with their smartphones. There had been an amazing upsurge in prosperity. Our first school project was dwarfed, in a good way, by high-rises all around. On that visit, I suggested that because the city centers were booming, perhaps we could help rebuild schools in the surrounding mountain villages, which are still quite primitive. The local authorities told us that they hoped everyone would be able to move out of the villages, because there is no way people can live prosperous lives in those areas. The land is arid; they can raise only a few goats and not really grow anything. With a better education at one of the schools, the officials said, the poor village children may be able to qualify for better jobs. By now, our Kowloon North and Macau clubs, with help from other Rotarians, have been able to give children in that region a chance to become educated in a safe environment. Du’an has been the perfect project. We were able to launch it, then eventually step away and applaud the success of the schools from afar. That is an ideal scenario. And there was no donor fatigue, as there can be when funding seems to go on and on with no end in sight and no progress. That brings up another point about philanthropy that I pay attention to: Who are we really doing this for? Is it to make ourselves feel good, or to provide genuine help where it’s needed? I’ve been supporting a hospital in Haiti that serves a region devastated by the 2010 earthquake, with no visible signs of improvement. The people are as poor as they’ve always been; there’s no end to the deforestation. They’re mired, and the moment the funding stops, the hospital will shut down. If we can just keep the hospital going, isn’t that enough? I try to remember that service is about serving, not getting something back in return. For the RI Afghan Refugee Relief Effort, which helped people living in refugee camps along the Afghanistan-Pakistan border, we raised over $2 million; I contributed a lot myself. Again, there was an open-ended need created by internal conflict, and we were able to adopt a few camps along the border to provide basic comforts and food. But there was another kind of reward, too. I visited Pakistan, where there are numerous Rotary clubs, and discovered that many of their problems are the same problems we deal with daily. That’s nothing I’d ever have learned sitting in front of a computer screen. Because of the success of my business, I also was able to give a large gift recently to The Rotary Foundation’s Rotary Peace Centers, in support of programs leading to graduate degrees or professional certificates in peace and conflict resolution at eight universities around the world. Our goal on the Rotary Peace Centers Major Gifts Initiative committee is to help raise $95 million to fund the Rotary Peace Centers program in perpetuity, in the hope that peace fellows will rise to leadership positions in their respective countries. The idea is to create a community of graduates so that, when conflicts arise between countries and cultures, these former peace fellows can get together and use their skills to resolve them before the tensions escalate. Did I ever expect to become involved in so many projects, or to meet my wife, Vivian, in the Rotary Club of Kowloon North – she is a past president of the Rotary Club of Peninsula Sunrise, Hong Kong – and to marry for the first time at age 53? I wouldn’t have laid odds on any of those things happening. But computer programs, even mine, have serious limitations. They couldn’t have predicted the adventures I’ve had or the personal rewards that have come my way through Rotary. I donate to The Rotary Foundation because I believe in its mission.